Bungie originally revealed Guided Games well before Destiny 2 launched back in 2017, heralding it to be a proper matchmaking system for the endgame activities in the shooter. In this Destiny 2 Guided Games page, we'll be walking you through everything there is to know about the feature in the game, including how to get a Nightfall Ticket, so you can undertake one of the elite missions with other players around the world. If you need anything else on Destiny 2 that isn’t about Guided Games, including a list of every Exotic weapon and armor item in the game, as well as the best methods to earn them, then head over to our Destiny 2 guides walkthrough hub. What is Destiny 2’s New Guided Games Feature? Announced back at the Destiny 2 reveal event as a big new feature in the sequel, Guided Games lets solo players pair up with Fireteams of two to tackle the Nightfall Strike, or Fireteams of five to take down a Raid. The Guided Games menu in Destiny 2. Seeker - This is the option for the solo player looking to team up with a Fireteam and take on endgame challenges like Nightfall Strikes and Raids. Since Guided Games is still in beta, you'll need a Nightfall Ticket to access this option (we'll explain the ticketing system further down). Guide - If two or more members of a Clan need a final player to head into the Nightfall Strike of Raid, then they are Guides, helping solo players through the challenges that await them as one group. If a team want to act as Guides, then at least half the Fireteam must be from the same Clan. How do I Get a Nightfall Guided Games Ticket in Destiny 2? 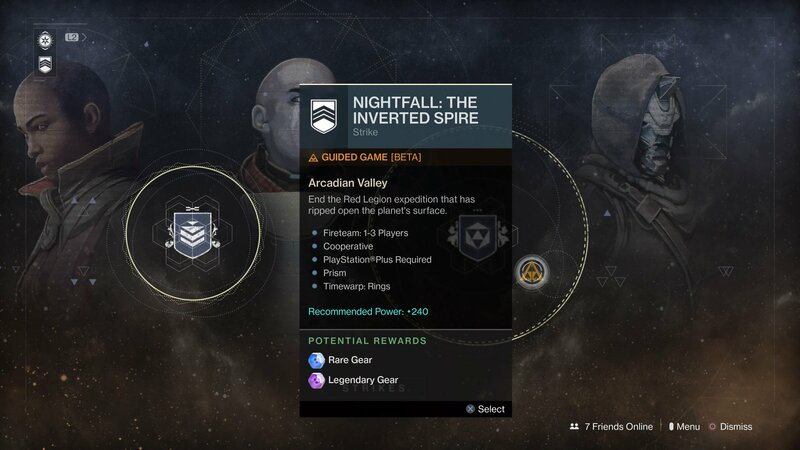 Although the Guided Games feature was originally in the beta phase for the first month after the game launched in September, it's not in full swing in late November, and you can now use your Guided Games Ticket to access the weekly Nightfall Strikes, and undertake the elite activity with several other players. 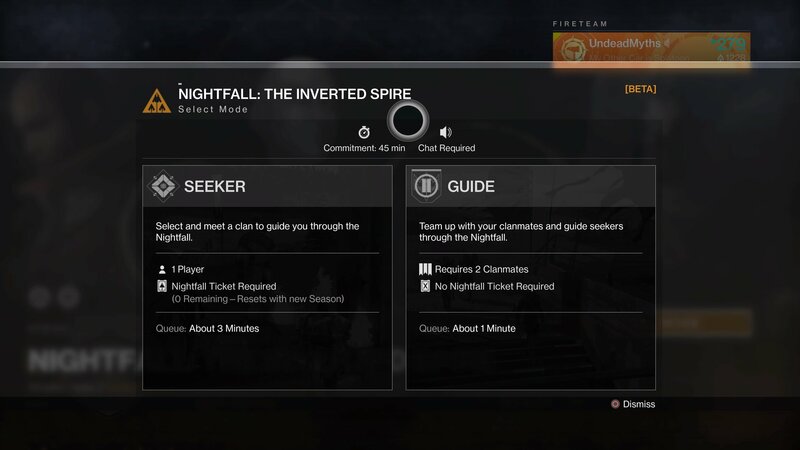 You'll need a Nightfall Ticket if you want to play the role of a Seeker. Keep in mind that you'll only be issed with a finite amount of Guided Games Tickets every week in Destiny 2. You'll therefore need to prioritise the activities that you use the Tickets on, as the 12 Guided Games Tickets that you can obtain from the Postmaster in either the Farm or the Traveler. If you eventually run out of Guided Games Tickets, you'll need to wait until the weekly reset rolls around for the game, before you can pick up more from the Postmaster. We have a wealth of Destiny 2 guides here at USgamer, covering all the above subjects and more, including our complete Silver currency guide, as well as our guide to the Destiny 2 Leviathan Raid.